For those looking for a highly concentrated omega-3 fatty acid with the best cost-benefit ratio, Jarrow's EPA-DHA Premium Balance 120sg will be a perfect choice as it comes with a whopping 600mg of omega-3 fatty acids per softgel. 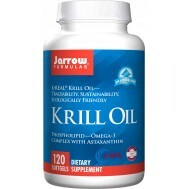 Jarrow Formulas EPA-DHA Premium Balance contains pharmaceutical grade, ultra- purified and highly concentrated omega-3 fatty acids from fish oil. EPA-DHA Premium Balance offers synergistic benefits from both important omega-3 fatty acids in a 2:1 ratio. • Purified by molecular distillation. Meets stringent CRN and proposed USP monographs for purity and is purified to remove heavy metals such as mercury and other environmental toxins. • Manufactured according to Good Manufacturing Practice (GMP) requirements. 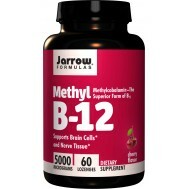 • EPA and DHA support cardiovascular and brain function, enhance joint mobility and mood. The omega-3 fats eicosapentanoic acid (EPA) and docosahexaenoic acid (DHA) have been widely studied and shown to support cardiovascular and brain health. In the 1970’s researchers began to realize that essential fatty acids from fish oil were beneficial to human health when it was discovered that Greenland Eskimos’ high fat diet from cold water fish was the source of their high incidence of cardiovascular health. For humans, it is essential to obtain both omega-3 and omega-6 polyunsaturated fatty acids (PUFA) from the diet. However, the average intake of omega-6s outpaces the consumption of omega-3s in the modern diet by at least ten times. This is in stark contrast to the equal ratio believed to have been consumed by coastal paleothic humans. Excessive intake of omega-6 fatty acids, particularly linoleic acid, from processed foods, corn-based products, and vegetable oils, are partly to blame. In the body, omega-3s and omega-6s lead to different types of eicosanoids, which, in turn, lead to a different set of inflammatory modulators called prostaglandins and leukotrienes. The crux of the problem is that the body relies on one shared set of enzymes (desaturases, elongases, cyclooxygenases, and lipoxygenases) to convert both omega-3 and omega-6 fatty acids into differently acting mediators. In general, these enzymes possess a roughly equal preference for both types of omegas when the fats are present in equal quantities. But changes in relative concentration skew this preference. As such, the modern imbalance can lead to inflammatory responses that are revved-up to start fires but less equipped to put them out. DHA is generally regarded as the brain healthy omega-3, as it is selectively incorporated into the nerves, retina, and gray matter of the brain—all tissues responsible for nerve transmission. In fact, DHA makes up about 40% of the PUFA in the brain and roughly 60% in the retina. It’s absolutely essential to developing brains and the primary reason fish oil is recommended during pregnancy and infants. 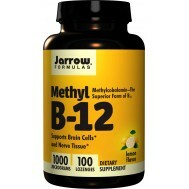 Mechanistically, its effects result from a powerful impact on the fluidity and function of cell membranes. 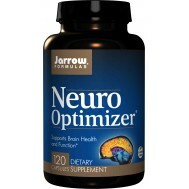 DHA is also a precursor to neuroprotectin D1, which has broad protective activity in the brain. In addition to critical brain functionality, DHA has been found to have effects throughout the body. It’s now beginning to be understood that DHA plays complementary roles to EPA in the cardiovascular system. 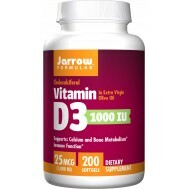 For instance, studies in both Japanese and Caucasian males have demonstrated a more potent effect for DHA than EPA on maintaining blood vessel health. EPA is generally classified as the heart-healthy omega-3, from fish oil. And there is an overwhelming amount of research to support the beneficial effects of EPA for cardiovascular health. Other effects include balancing blood-lipids, supporting blood-vessel health, and promoting healthy blood pressure. Yet, similar to the situation with DHA, accumulating evidence suggests that EPA is more important than previously surmised for other bodily systems. In fact, recent research on mood and behavior has found that EPA may be more important than DHA in this regard. Like omega-3/6 balance, so too should there be EPA/DHA balance in adults since both act throughout the body in complementary ways. In general, they should be taken together and neither taken to the exclusion of the other. But an answer on the exact balance is less clear-cut. If we look to nature for an answer, we find that the ratio of EPA:DHA ranges from 2:1 to 1:2, depending on the species. EPA-DHA Balance® contains ultra-purified and highly concentrated omega-3 fatty acids from fish oil. EPA-DHA Balance® offers synergistic benefits from both important omega-3 fatty acids in a 2:1 ratio. take 1-2 softgels with a meal once or twice a day or as directed by a qualified physician. take 2-3 softgelswith a meal twice a day or as directed by a qualified physician. keep away from light or heat, keep otherwise dry and closed at normal room temperature between 15 - 22°C. people with seafood allergies or coagulopathy, or who are taking anticoagulants or other blood thinning medications, or facing surgery should notify their physician before using fish oil.